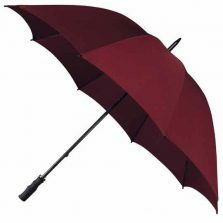 View basket “StormStar Windproof Maroon Golf Umbrella” has been added to your basket. This maroon golf umbrella will blow you away! Stay safe and look good on the course without breaking the bank. Scroll down for more. Looking for a cheap, windproof, storm proof maroon golf umbrella? 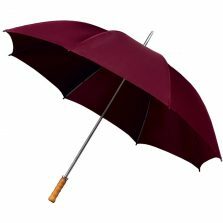 These stylish maroon Budget Storm Golf Umbrellas are great value for money. All the quality of a storm proof umbrella but available at a budget price – the Budget Storm maroon golf umbrella has storm proof fibreglass ribs to resist and survive those strong damaging winds. A sleek black smooth round rubber handle adds that extra style to this modern looking maroon golfing umbrella. When the umbrellas absolutely have to be windproof umbrellas or storm proof umbrellas but the marketing budget is tight, then this Budget Storm maroon golf umbrella really does make for a great value windproof promotional printed advertising umbrella. If you need them printed with your company logo, talk to us – we’ll be happy to give you a quote. Not the umbrella you’re looking for? 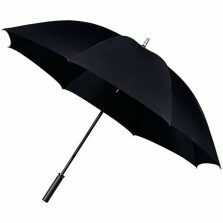 Check out the rest of our golfing umbrellas!